How can you help your 401k clients meet the minimum standards of prudence that ERISA imposes, regardless of plan size? It’s a common challenge…Small plan clients generate less revenue and typically don’t want to be as involved in the full suite of education, documentation, and hands-on services that a larger 401k client might embrace. In fact, most would just prefer to run their business and know that their plan is being handled by the providers engaged on the plan. As you move up-market, you have to provide a more robust suite of services in order to be competitive, provide the additional support larger plans need, and keep your competition out. But how do you create a service process that’s appropriate for the market you’re in? There is no right or wrong or one size fits all service process. Depending on your experience, resources, background, capabilities and market, your service model might be simple or comprehensive, normal or unique. What matters is that you’re able to provide services that help plan sponsors and participants run a successful and compliant plan, at a fee that is reasonable. As you know, the requirements under ERISA apply to all covered plans, irrespective of the number of participants, size of the company, or assets in the plan. There are certain minimum requirements that must be followed and there are some ways that you, as the 401k advisor, can provide support. First, it’s important understand the rules and what’s required to demonstrate prudence, then to define a minimum level of service and documentation needed as a starting point. Next, once you’ve determined what all clients should have on file, you can identify how to best deliver the information and services based on the time and resources available. (Translation: How much time you’re willing to spend and they’re willing to give based on plan size and revenue). 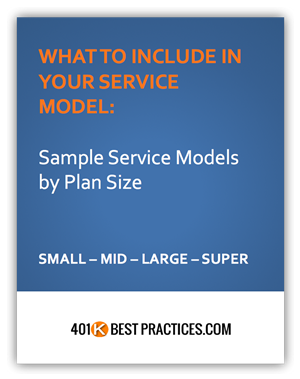 If your average plan size is one million dollars, your service model will look quite different than that of an advisor in the 50 million dollar market or above. There are many ways you could define a segment of the market. You’ll find that even in the Service Model Strategies Guide I developed that you can download at the end of this post, I use two alternative segmentation examples then those listed above. It’s not so much a matter of HOW you choose to define the different segments of the market, but THAT YOU DO segment your audience and determine, based on your service and fee schedule, what is the most appropriate method of delivering the agreed upon services. Now that we’ve both identified the minimum required elements all plan sponsors must cover, and segmented clients by assets, here is an example of how to plan out the best way to help your clients document the required elements, and what additional services or documentation might be part of your service model for larger plans with more complex issues. Next, it’s important to evaluate the best way for you to manage your business and implement a process that allows you to cover each item in an efficient manner. 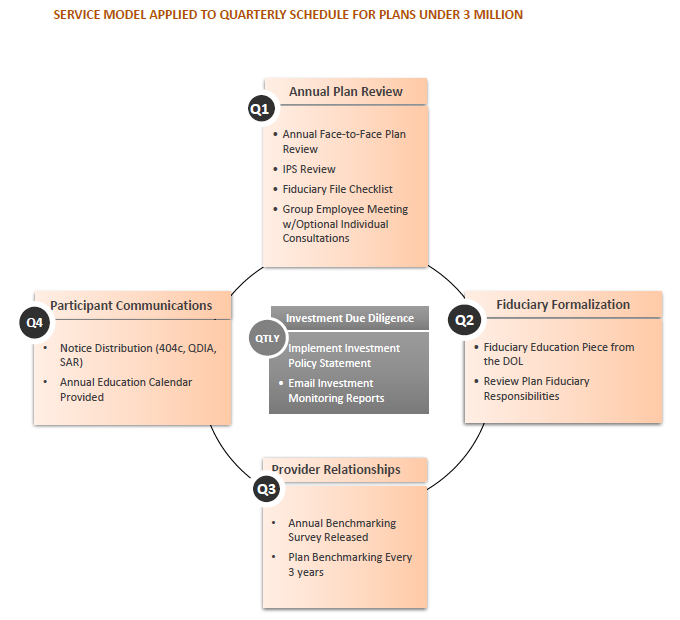 As I mentioned in my last post on how to conduct a 1-hour annual plan review meeting, while a plan sponsor is responsible for demonstrating prudence in all areas of compliance, it’s not a requirement, or a good idea for that matter, to try to cover it all during a 4-hour once-a-year meeting. 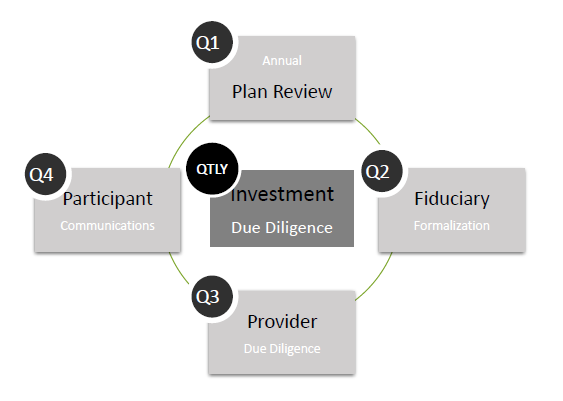 If you take the required elements (by category – investment due diligence, plan administration, participant communications, fiduciary responsibilities, and provider due diligence) and try to cover all review and documentation requirements at once, you may as well schedule an individual annual plan full-day workshop for each client. A better method is to look at addressing one key element each quarter over the course of a year, leaving just one or two remaining items to cover at the annual plan review meeting. If you cover the same topic in a quarter, for ALL of your clients, then you start to create efficiencies as you systematize your service model. 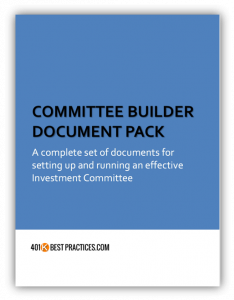 As your 401k client base changes (plan assets grow, number of participants increase, plan complexity increases, committees get formed, additional providers are retained, etc.) consider what additional documentation should be on file, what additional services might be needed, and what changes should be made to the fee structure to ensure continued reasonableness. 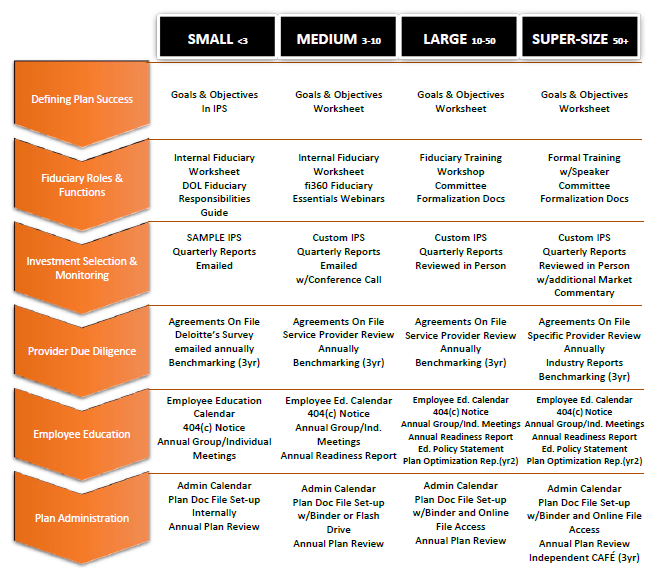 If you’ve done the work of segmenting your clients, defining the minimum level of service for all clients and mapping out what additional services you’ll add as plan assets grow, it becomes easy to shift your clients to the next service schedule once they reach the predetermined milestones. Simple enough, right? You got this. To make it easy for you – I’m giving you access to the Service Model Strategies Guide that I developed that has been one of the most popular bonus resources on this blog. Grab your copy of this valuable resource here.